a few uses. Think of the many other items in your plant that you can weigh with it. provided). For night use, you light up the display area by just touching the "lamp"
display (such as our P-DP printer or SA2000 display). 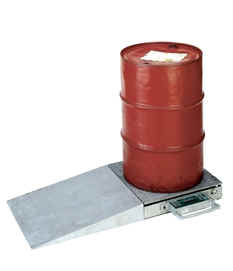 This unit is designed as an NTEP Class III weighing device. Charging Voltage: 11.5 volts to 14.5 volts DC. Protection is provided for accidental reversal of charging connections. Charging Current: Starts at 300mA and drops down to 50mA after 8 hours. Charging Time: 8 hours if the batteries are discharged to the point of shutting off the scale. Construction: All aluminum design provides EM/RFI immunity. Voltage; Self-contained nickel cadmium batteries (standard) or alkalines. Integral recharger to charge or operate from a 12, 110 or 220 volt power source. General: All located on waterproof membrane keypad with large contact surfaces. On/Off: Two separate switches for unambiguous operation. Zero/Test: Pushbutton zero checks for motion to HB-44. Test performs internal test. Hold/Release: Hold places scale in automatic capture mode for in-motion weighing. Release places scale in "normal" static weighing mode. Lamp: Momentary action to activate high efficiency light emitting diodes for night usage. Local/Total: Local is the standard mode for weighing. Total enables the scale to accumulate weights with other similar scales. Speed: 950 milliseconds to typical reading (static). Accuracy: ±0.1% of reading static mode. ±0.2% of reading holding mode.